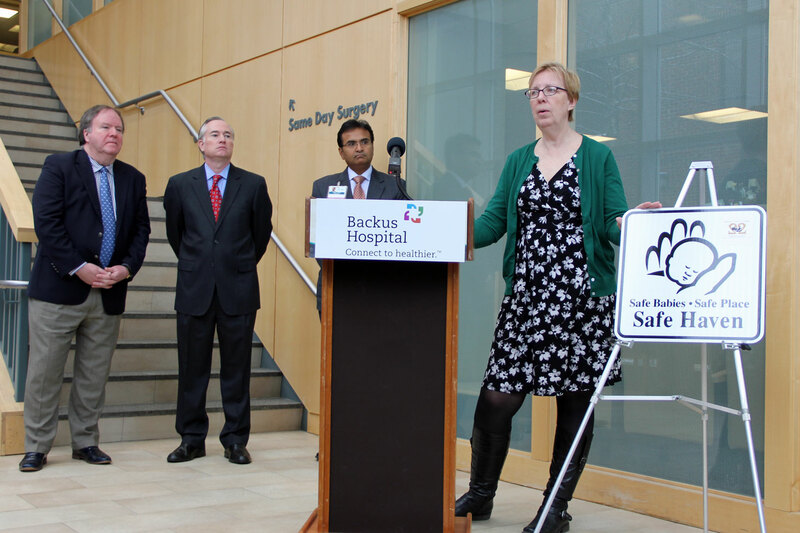 I'm glad I was able to join my fellow legislators, Sen. Cathy Osten and Rep. Emmett Riley, at Backus Hospital to highlight Connecticut's Safe Havens Law. Since the law was established in 2000, 27 infants have been turned over to Connecticut hospitals by a parent, who are able to do so anonymously and with the assurance that the child will receive immediate care. The program provides a safe alternative for parents who may feel as though they are unable to care for their child and lack options, which could otherwise lead to a tragic outcome like the abandonment, or even death, of the child. The law enables a parent to bring an infant 30 days or younger to a hospital emergency room and avoid prosecution for abandonment. A nurse will ask the parent for their name and for medical information on the infant and parent. The parent does not have to provide that information. DCF will obtain custody and place the baby with a family who is already licensed and intends to adopt the baby. The Department will provide support to the baby’s new family while terminating the biological parent’s parental rights so that the adoption can become final. Connecticut law requires that a child can only be placed by the Department with a person licensed to provide foster or adoptive care.